You are currently browsing the tag archive for the ‘1935’ tag. In ‘Mickey’s Kangaroo’ Mickey receives a kangaroo for a present. 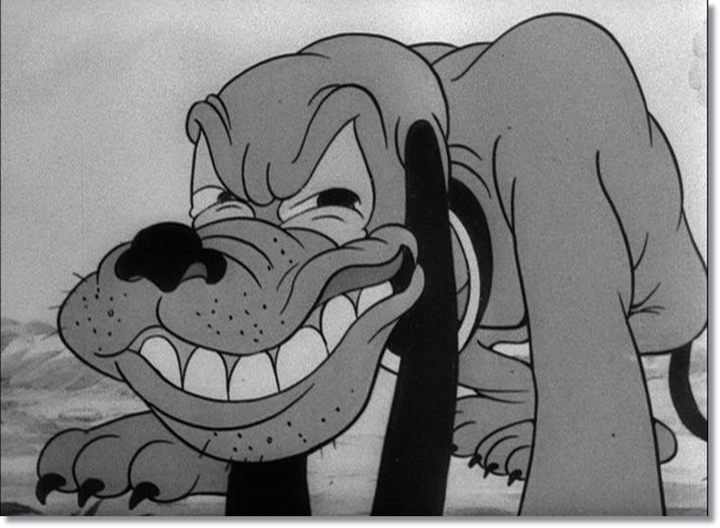 Pluto grows jealous of the intruder and its little kid, which is expressed with side glances at the audience in extreme close ups, and through a tough and sneaky voice over by Don Brodie. 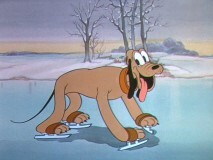 This is a rather weak device to overcome Pluto’s silent character. While Pluto tries to get rid of the little kangaroo, Mickey gets beaten up by mama kangaroo, but he keeps laughing. As Jim Korkis reveals in ‘The Book of Mouse‘, ‘Mickey’s Kangaroo’ surprisingly is a film based on a true story. In 1934 Walt Disney got two wallabies as a present from Australian wine maker Leo Buring. By the time they arrived at the studio, the two marsupials had given birth to a child. The three wallabies were kept in a pen outside the studio department. ‘Mickey’s Kangaroo’ became Mickey’s last cartoon in black and white, being released even after ‘The Band Concert‘, Mickey’s first one in color. Unfortunately, it’s not a very funny goodbye to the black and white era. 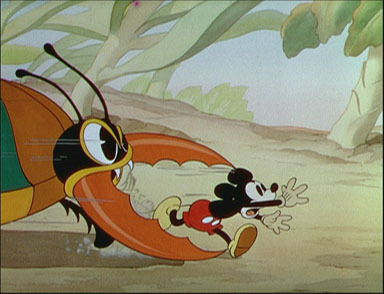 Nevertheless, its story line would be reused in ‘Mickey’s Elephant‘ (1936). 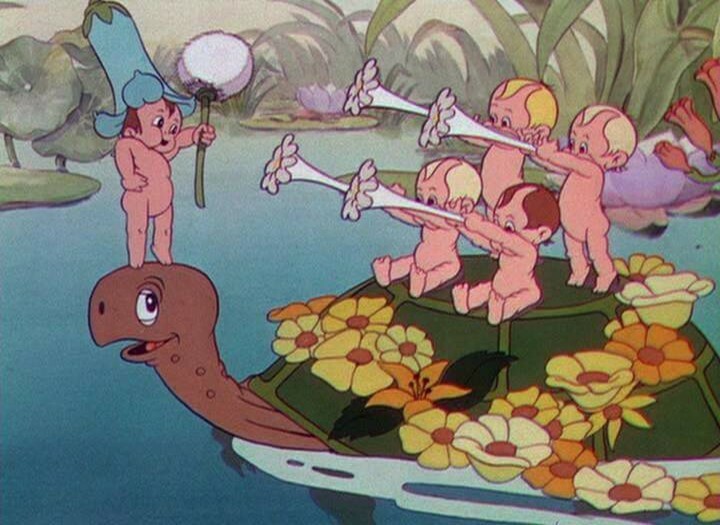 ‘Mickey’s Garden’ is Mickey’s second color cartoon (after ‘The Band Concert‘). It’s also Pluto’s first: he passes the transition into color fluently, getting his typical orange color we’re all familiar with now. Mickey and Pluto are in the garden trying to kill a number of insects eating Mickey’s crop. When Mickey accidentally sprays himself with bug poison he starts to hallucinate (the transition to the dreamworld is particularly psychedelic: everything, including the background becomes unsteady and wobbly). He dreams that all plants and bugs have grown. This leads to some imaginative scenes. The bugs are not very lifelike, though. 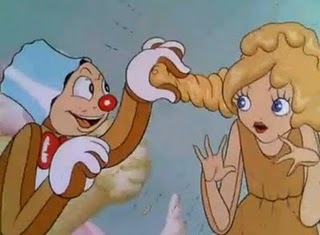 The animators even make a weird mistake by giving a particularly evil-looking beetle eight legs instead of six. Almost three years after ‘Flowers and Trees’ Mickey finally made the step to color, and it’s probably because of this that ‘The Band Concert’ has such a Silly Symphony-like feel to it. 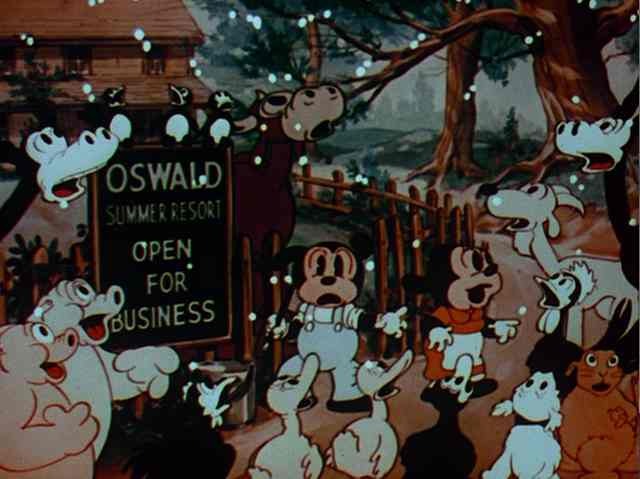 In 1935 the concept of a concert cartoon was already an old one (Mickey’s first was the ‘Barnyard Concert’ from 1930), but it finds the peak of perfection in this one. Likewise, the use of Gioachino Rossini’s ‘overture Wilhelm Tell’ and ‘Turkey in the Straw’ in cartoons was far from new, but who would have thought that the two tunes would fit together so perfectly? The overture is played inside-out culminating in the storm sequence which brings forth a tornado. That’s how it feels, Mickey is not only conducting the storm music but even the real storm itself! Notwithstanding the cartoon being a Mickey Mouse showcase, it’s Donald Duck who is stealing the show, like he did in the two previous Mickey Mouse cartoons he appeared in: ‘Orphan’s Benefit‘ and ‘The Dognapper‘. Being the only character in the cartoon born in color, Donald makes the transition from black-and-white to color naturally. 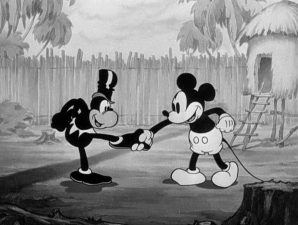 Mickey and the other characters, on the other hand, still have a strong black-and-white feeling in their design and are less fitting in the bright world of color. 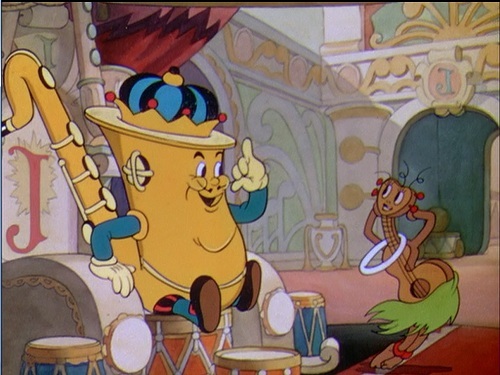 During Mickey’s concert, Donald produces an unending supply of flutes out of nothing, playing ‘Turkey in the Straw’ right through Rossini’s music (this ability of bringing forth material from out of nowhere was a capability that Donald would soon lose, but it would become a trademark of Bugs Bunny several years later). 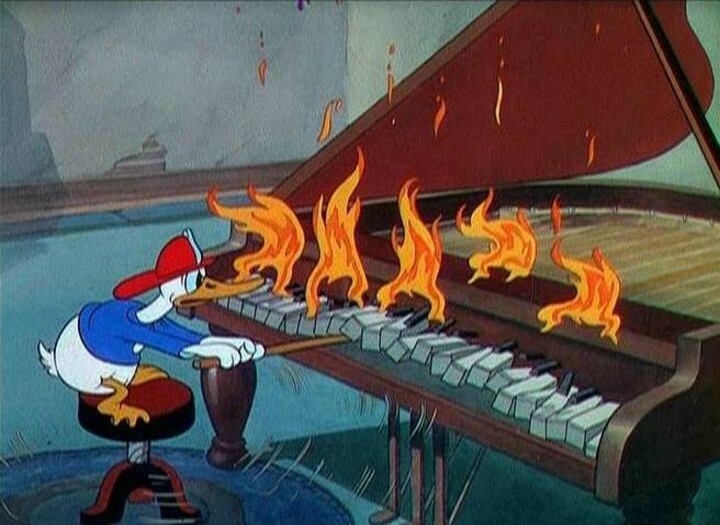 It’s a bitter irony that it’s this tune, ‘Turkey in the Straw’, which signals Mickey’s demise, because it was the same tune that made Mickey a star in the first place. 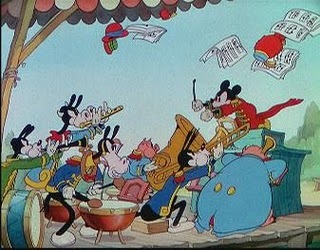 Nevertheless, ‘The Band Concert’ is without doubt Mickey’s best concert cartoon, arguably his best cartoon since ‘Steamboat Willie‘ and certainly one of the most perfect animated cartoons ever made. 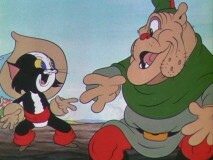 ‘The Robber Kitten’ is one of the more annoying entries in the Silly Symphony series. Being a Silly Symphony, its animation is top notch, especially the character animation of the little rascal Ambrose (or ‘Butch’ as he prefers to be called) and the experienced robber Dirty Bill. But, the story is slow-paced, childish and dripping with morality. The setting is vague and pretty unconvincing: Bill is clad in a medieval Robin Hood-like costume, while Ambrose is clad in 17th century fashion. A much sillier world as that of ‘The Cookie Carnival’ was brought with much more bravado. All too typical for the Silly Symphonies of the mid thirties, ‘The Robber Kitten’ is nothing more than beautifully animated pulp.